Some companies have very erratic dividend payments. Not because management is incompetent or doesn’t care about the dividend, but because of the way the business is structured. Based on its last monthly distribution, San Juan Basin Royalty Trust (NYSE: SJT) pays a 12% yield. But that’s misleading because the distribution is variable. Hilcorp Energy Company owns natural gas rights in the San Juan Basin in New Mexico. Each month, it receives revenue from the sale of natural gas. It then sends 75% of the net profits to be distributed to San Juan Basin Royalty Trust shareholders. Trust shareholders receive distributions each month. Because the amount of revenue and profits vary every month, so does the distribution. Through the first three months of this year, the trust has paid out $0.13 per share (or $0.52 annualized), which is sharply lower than last year’s $0.84. If it were to pay out $0.52 per share this year, that would still be a respectable 7.6% yield… but not the mouthwatering 12% you see now on some financial websites. The advantage of a setup like this is that when the company makes money, the investors get paid well. 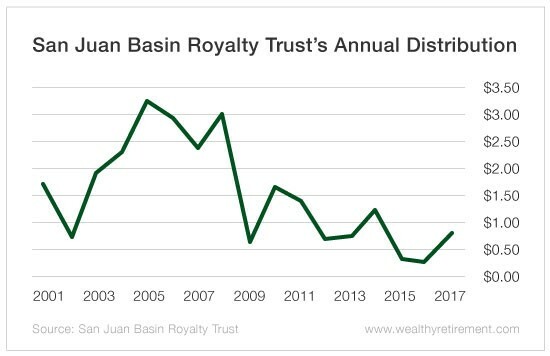 If natural gas prices rise, San Juan Basin Royalty Trust’s income will likely rise too and shareholders will receive that income. The opposite is true when natural gas prices fall. It’s also important to understand that investors will receive income only as long as natural gas is being produced from the company’s land and sold. San Juan Basin Royalty Trust is not allowed to acquire new wells or other companies. So investors will get paid based on whatever gas is pulled out of the ground and nothing more. Independent engineers believe there is about 10 to 15 years’ worth of gas left that can be produced. BlackBerry’s India Woes To Continue?